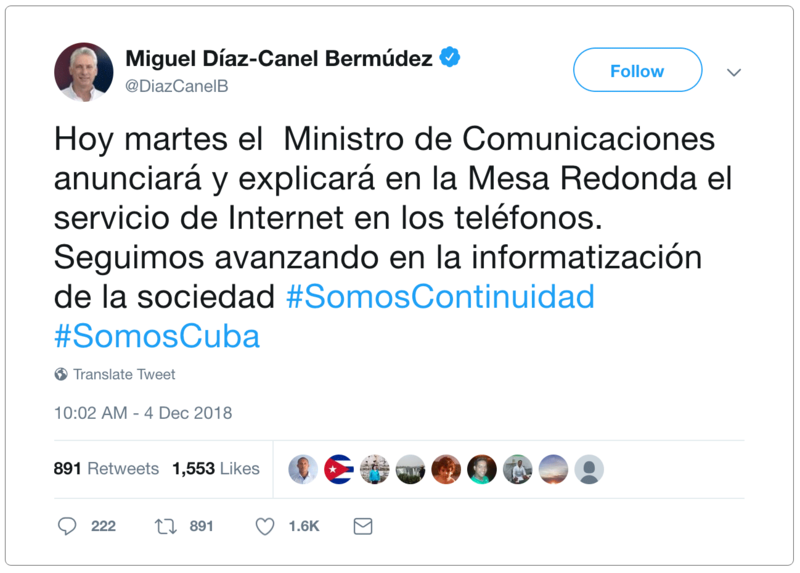 President Diaz-Canal's tweet on the annoucement of the 3G mobile access for Cuba.The economic and social benefits of free 3G Internet connectivity would easily outweigh the cost. Last week ETECSA began offering 3G mobile access to Cuba's national intranet and the global Internet and President Diaz-Canal tweeted the news. His tweet has received 216 comments so far and reading through them, many are effusively positive, like: "This is without a doubt a breakthrough that will benefit millions of Cuban families!! Congratulations!!" and "Excellent news comrade!" Others were critical, noting that the prices are high relative to Cuban incomes (one said "absurd") and the technology is obsolete — "Congratulations, but they're 20 years late." I cannot agree with the de rigueur/obligatory congratulations — third generation mobile is over 15 years old, only 66% of the population is covered, the price is very high relative to Cuban salaries (access to the national intranet is cheaper than global Internet access) and performance is unknown — but this is a faltering first step and, like WiFi hotspots, street nets, El Paquete Semanal, navigation rooms and home DSL, it should be seen as an interim, stopgap measure. Hopefully, the Cuban Internet will eventually leapfrog over current technology to next-generation technology — in the meantime stopgaps are better than nothing. The next stopgap goal should be to make ubiquitous 3G mobile Internet access free — like free streets, sidewalks, education, etc. Doing so would create a nation of trained, demanding users leading to the development of innovative, practical applications. ETECSA, Cuba's government monopoly ISP and phone company, may complain that they do not have the infrastructure to support the traffic that free 3G would generate and can not afford to build the capacity. I have no information on the specifications of the 3G base stations they are installing, but it is probably safe to assume that there is spare capacity since 3G data rates are far below those of today's LTE technology. (A friend just told me that he was seeing 1 Mbps in Havana). The traffic from free 3G would also require backhaul capacity from the base stations and that can be provided by satellite as well as terrestrial fiber and wireless infrastructure. Cuba currently uses SES's O3b (other three billion) medium-Earth orbit (MEO) satellites for international connectivity and they could also use the O3b network for mobile backhaul. (Note that O3b capacity will increase dramatically in 2021). O3b is operating MEO satellites today, and they will be joined in the early 2020s by low-Earth orbit satellite constellations from SpaceX, OneWeb and Telesat, which are also potential mobile backhaul providers. Both ETECSA and the Cuban society can justify the investment needed to provide free 3G Internet access. Bob Metcalfe, the inventor of Ethernet, coined "Metcalfe's Law" saying that the effect of a network is proportional to the square of the number of users. While not a precise mathematical statement, there can be no doubt that the effect of a network on society and its value to whoever owns it increases rapidly as it grows. As noted, 3G technology is obsolete and one day Cuba will be rolling out modern technology. When they do, people who have been using 3G will understand its value and the value of the applications they have been using and many will be willing to migrate to and pay for faster service. In addition to trained users, free 3G would generate application developers and Internet entrepreneurs. They would develop 3G applications and content for Cuba and other Spanish speakers around the world and would transition to modern infrastructure when it becomes available. I've been talking about free 3G from the standpoint of ETECSA and application developers and Internet entrepreneurs, but consider the social benefit of reducing the digital divide and improving government, education, health care, entertainment, tourism, finance, and other businesses, etc. This has been a back-of-the-envelope case, but it seems clear that the economic and social benefits of free 3G Internet connectivity would easily outweigh the cost. Let's flesh the proposal out. Local Time: Tuesday, April 23, 2019 07:07 AM PDT – Page Load: 0.3756 Sec.